Real Madrid got their La Liga campaign underway with a win last weekend, and it appears as though it took some of the pressure off the players in training this week. Julen Lopetegui’s men slipped to defeat against city rivals Atletico Madrid in their UEFA Super Cup clash earlier this month, thus leading to immediate question marks being raised over the Spanish tactician and his squad. Having failed to replace Cristiano Ronaldo thus far after his move to Juventus with just one week remaining in the transfer window this summer, it remains to be seen if that is something that the Spanish giants live to regret. 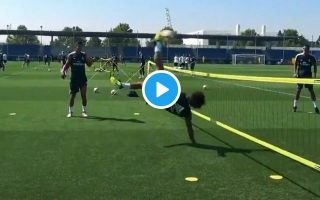 Nevertheless, the remaining Real Madrid squad seemingly remain in high spirits as while taking a break from training, they opted to start a game of foot tennis and as seen in the video below, Marcelo produced a brilliant finish to win the game with an acrobatic overhead kick. Lopetegui will now be hoping that the apparent relaxed atmosphere at training will help them to continue to improve and build morale and confidence in what is undoubtedly going to be a difficult season for all concerned.